Consolidation continued in Friday’s trade as the benchmark Index ended the day gaining 9.65 points or 0.09%. The Markets saw a modestly positive start but later slipped under some corrective pressure. However, NIFTY recovered 60-points from the low point of the day before ending with modest gains. As we step into fresh week we expect a flat start to the trade. The NIFTY has been consolidating near its pattern resistance area. For tomorrow and for coming days, it would be imperative for the Markets to move past 10820-10850 zones for resumption of any meaningful up move. Monday is likely to see the levels of 10850 and 10895 acting as immediate resistance area. Supports come in at 10765 and 10710 zones. 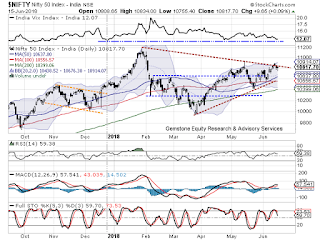 The Relative Strength Index – RSI on the Daily Chart is 59.3764 and it remains neutral showing no divergence against the price. The Daily MACD stays bullish while trading above its signal line. On the Candles, a candle with a long lower shadow occurred. In the present context, it holds little significance as it has occurred during an upside. However, since it has also occurred after some consolidation, it offers mild possibilities of fresh attempt by NIFTY for a resumed up move. Going by pattern analysis, NIFTY has continued to resist to the falling trend line that begins from 11170 and then subsequently joins the lower tops. It would be critically important for NIFTY to move past the 10820-10850 zone for resumption of any meaningful up move. 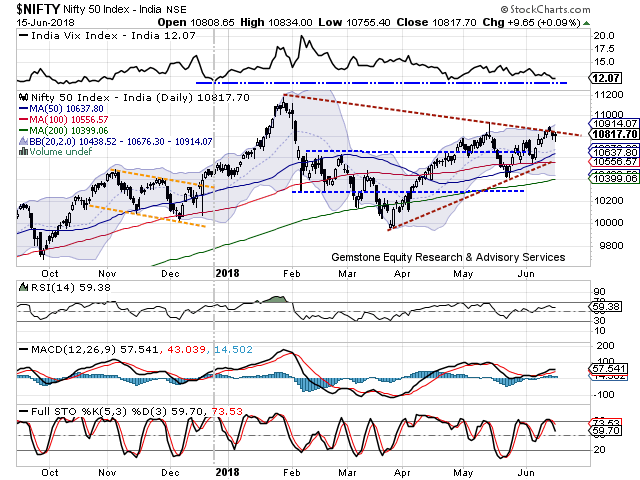 Overall, the undercurrent continues to remain buoyant and the F&O data also suggests NIFTY has some more steam left and it may attempt to move past the pattern resistance area near which it is currently consolidating. However, until the levels of 10820-10850 are breached on the upside, we continue to recommend caution at higher levels and guard profits with each up move. Overall, positive caution is advised for the day. Long positions were seen being added in RELIANCE, WIPRO, INFOSYS, BAJAJ FINANCE, AURO PHARMA, BERGER PAINTS, TCS, KOTAK BANK, TORRENT PHARMA, TCS, GRANULES and DR REDDY.